For the past couple of weeks, I have been baking and canning jellies and jams to take to our local farmer's market. Believe it or not, it has been a dream of mine to be able to bake and make items to sell. While I would really love to own a little restaurant, similar to what my dad owned, at this time the farmer's market is about all we can handle. 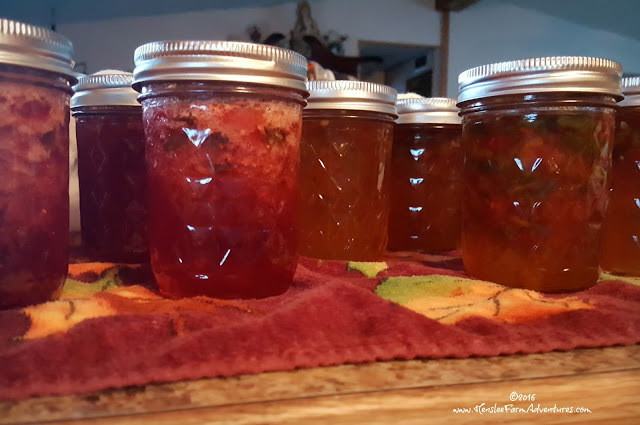 As I stood last night at my kitchen sink, looking out the window and stemming strawberries to make strawberry jalapeno preserves, I got a strong sense of déjà vu. I realized that the food itself was bringing back memories. Memories of my childhood, of when my mom and dad would can jams and jellies. When we would get together with my grandparents and make pies to go into the freezer for winter. The food connected me to my childhood. In fact if I stood there long enough I could imagine standing at my parents' kitchen sink, looking out their window, helping to get whatever produce was ready to either can or go into the freezer. Tradition in our family and in many families can be found in the food that we eat and make. There are certain things that we always make on holidays. For Easter it is ham, deviled eggs, and my grandmother would always make angel food cake with strawberries. For the Fourth of July, growing up we always had watermelon and homemade ice cream. Thanksgiving of course means turkey, our family's special dressing (stuffing), and pumpkin pie. And of course on Christmas we would have homemade candies that was only made during that season. 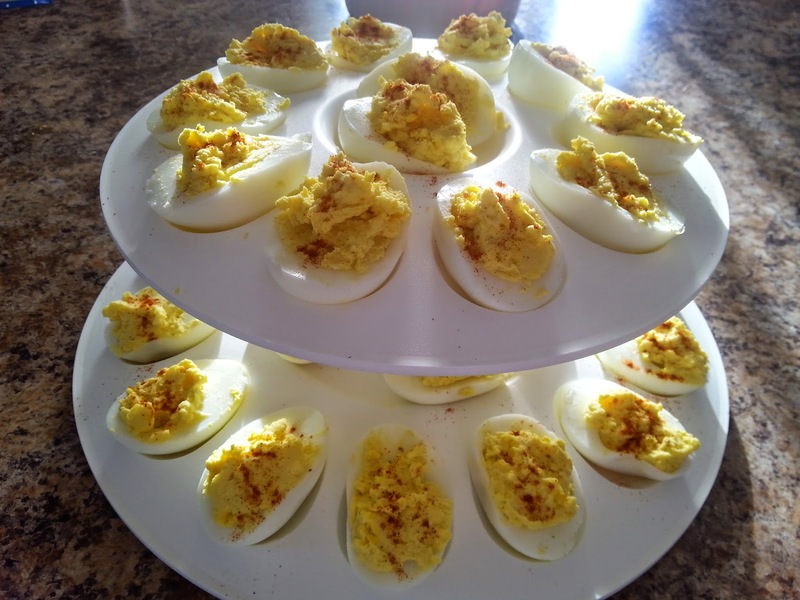 Homemade deviled eggs, a tradition at many of our family gatherings. I try to carry on some of these traditions for my children, but I also try to start new traditions for them. They will grow up eating strawberries and pie crust for Easter, and for the Fourth of July, since my daughter is allergic to dairy, there is no homemade ice cream. Instead we stick to fruit kabobs and of course grilled hamburgers and hot dogs. Thanksgiving we still have our traditional family meal, and for Christmas, I make several of the candies that I grew up with. One of the best gifts I have received was from my cousin Jim. To most people it would have no value, in fact it really has little monetary value, but to me it is worth everything. It is our grandmother's rolling pin. It still has the dough on it from the last time that she used it. She passed away in February of 1988, I was only 14 years old. When I look at that rolling pin, I think about her and her raisin pie and her stacked applesauce cake. I also think about how much she loved all of her grandchildren and how kind she was to us. I know that when Jim looked at the rolling pin, he had different memories of her, but still loving memories. He is older than me and while we didn't grow up together, we share what matters most, a grandmother, a rolling pin, and sweet memories. 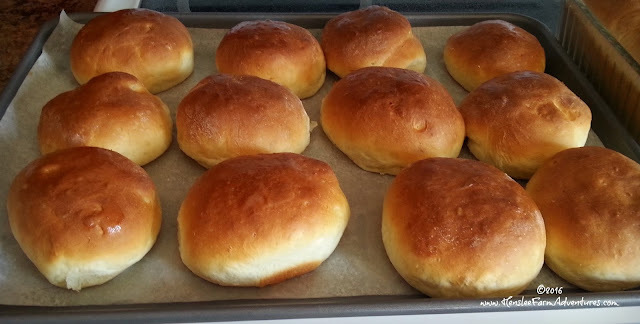 So as I make the jams and jellies, as I bake my dad's famous hamburger buns that he served at his restaurant, I am making new memories and traditions, while still carrying forward the old. These memories are ones that my children can look back on and remember, fondly I hope. Memories that I hope they will carry on as they raise their children. Memories that are all founded in food. 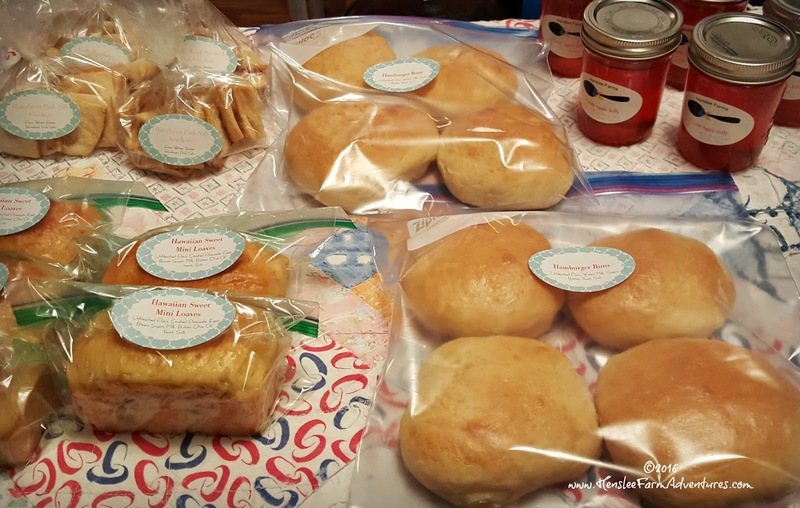 What food traditions does your family have? Let me know in the comments below.